Located to the far east of the state, Goa’s most magnificent natural phenomena can be encountered. The Dudhsagar Waterfalls are a famous Goan resident, recognised as the second-highest waterfall in the whole of India, measuring an impressive 603 metres tall. 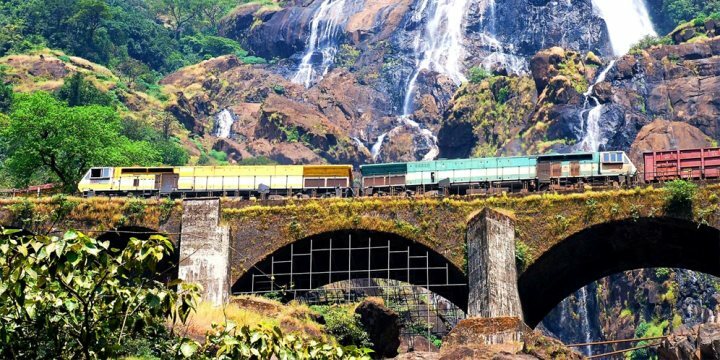 Paying a visit to the falls is one of the most adventurous things to do in Goa, as you travel deep into the verdant forested outskirts of the state, known as the Western Ghats. Most visitors on their Goa holiday will reach the falls via a jeep ride which travels through beautiful natural settings, including the Bhagwan Mahavir Wildlife Sanctuary. A short hike will then bring you to the falls, surrounded by dense jungle and cascading down a mountainside behind a railway line. If you’re feeling a little warm and sticky after your hike to the falls, there is an opportunity for visitors to take a dip in the deep green waterfall pools that sit at the base of the falls. There’s nothing more refreshing and rewarding than having a soak amid the splendour of Goa’s most majestic natural setting.